With all this chatter on the facebook about Days of Rage, camp 6, burning of tires and boycotts against the Weekly Volcano for spending your hard earned advertising dollars on illegal Clear Channel billboard rentals you'd think that the Mayor's Civility code of conduct was just another pointless symbolic gesture, a plea really, for us all to show our quality... good sportsmanship etc. 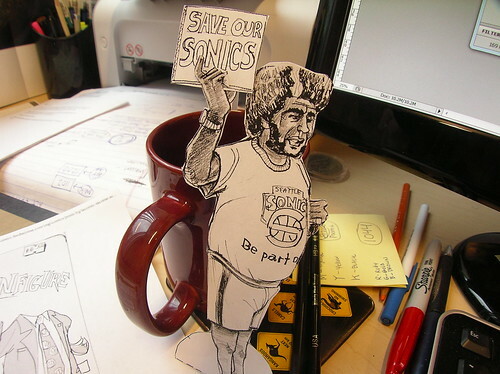 Well, ONE MAN has been living by example of the civility code: SAVE OUR SONICS GUY! I've been studying his dos and don'ts online. Great tips for anyone pushing a cause to win friends and influence people. DID YOU KNOW: He hasn't given up on his dream. Right now he is working hard on a citizens initiative petition to get the current Washington State song (a real snoozer) changed to the old Super Sonics Sir Mix-A-Lot rap music song that I believe would be exceedingly progressive. Read about it here in the Weekly Volcano THEN boycott that treacherous weekly newspaper forever! by tommyllew on 3/22/2011 @ 6:57am Nice job, Ryan. I love this dude. He keeps the faith like no one I've ever met. And he commits--all the way to downtown Freddy Brown sideburns. by NineInchNachos on 3/22/2011 @ 8:09am Thanks Tom. There is still time brother! by KevinFreitas on 3/22/2011 @ 8:24am He was hanging out just feet from us last night at The Red Hot! I felt cool just being near him. by NineInchNachos on 3/22/2011 @ 8:40am Did you sign his petition Kevin? by Chase on 3/22/2011 @ 9:14am These action figures make living in Tacoma worthwhile. Ok the double rainbows help too. by NineInchNachos on 3/22/2011 @ 9:25am Farmers Market Season is coming up. Remember if you see this man, let him know you're boycotting Starbucks and ask to sign the petition ! by Anders on 3/22/2011 @ 10:25am Kris Brannon (the guy's actual name) owns a very entertaining comedy club downtown. It's the Comedy Underground, on 9th & "A" street. Helluva guy. by NineInchNachos on 3/22/2011 @ 10:35am Thanks Anders! Somewhere I have a Jake Fey campaign mailer I saved because it had a picture of the Sonics Guy (Mr. Brannon). by inbloodyrise on 3/22/2011 @ 11:15am we should probably build a new tacoma dome and buy a failing franchise of pro basketball bbefore seattle. tacoma sonics sounds okay. in the meantime, we already have semi-pro. the tacoma tide also own a minor league basketball team. i have never seen them play as their season was about the same time as the soccer team last year. by Marty on 3/22/2011 @ 11:53am "Tacoma Tacomics" pro basketball team has a nice ring to it. by Adam the Alien on 3/22/2011 @ 12:34pm Kris is both a hilarious comedian and a genius improver. He's an on-again, off-again member of The Tokens as he has time. by TDI-Reporters-Notebook on 3/22/2011 @ 3:24pm i saw this guy five minutes ago parking his car on pacific avenue right across the street from my office. by NineInchNachos on 3/22/2011 @ 4:06pm he's hard to miss. by Dave_L on 4/3/2011 @ 10:55am Kris and Doug Mackey did a great play-by-play at the John Carlton/Lynn Di Nino Tollefson Plaza "Mega-Chess" 1956 "Game of the Century"
by NineInchNachos on 4/3/2011 @ 9:42pm THIS TACOMIC HAS SOLD! THIS IS A BIG DEAL!!!!!!! by inbloodyrise on 5/5/2011 @ 3:32pm i guess that tide basketball will not happen this year. by L.S.Erhardt on 5/5/2011 @ 11:58pm Really? 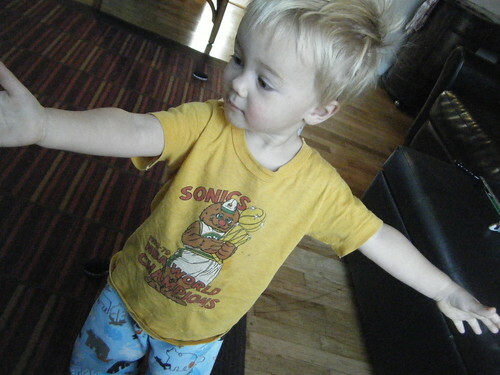 The Sonics moving to Oklahoma was one of the highlights of the last 10 years. I'm hoping for the Mariners, Seahawks and Sounders to follow suit. by inbloodyrise on 5/6/2011 @ 3:48am i heard that the earth opened up during the last sounders match and murdered the whole team, and their fans. so we should be ok on that part. why don't we have any Tacoma Super Heroes?